Shively Motors of Shippensburg is proud to own and display a wide variety of our history! Walter P. Chrysler purchased the Dodge Brothers motor company in late 1928. Production was already in place for the 1929 model year. 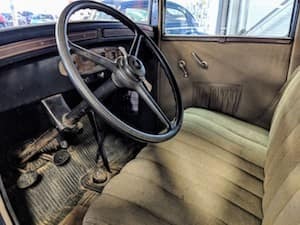 The 1930 Dodge Brothers was then the first Chrysler designed Dodge to be built. This was also the first year that Dodge introduced an 8-cylinder engine. 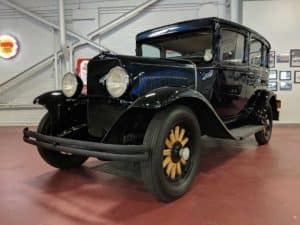 In 1930, Dodge Brothers drove a new stock DD8 over 50,000 miles in 19 weeks to prove its dependability. The car was driven under every condition of road and weather. The Mileage Marathon was sanctioned and supervised by AAA and was the greatest dependability exhibition ever attempted at that time. 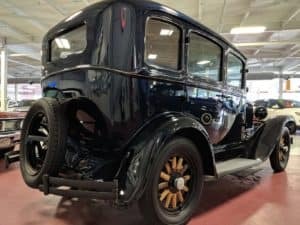 This particular 1930 Dodge Brothers DD6 sedan was built April 9, 1930 and shipped to Chambersburg, Pennsylvania. It was originally sold by Rippey T. Shearer in Chambersburg on June 15, 1930 to the Hoffman family. 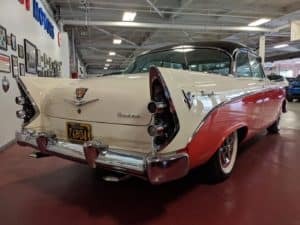 Paul and Edna Funk purchased the car from that family in 1965 for $300 and continued to own and drive the car until 2017 when purchased by Shively Motors. 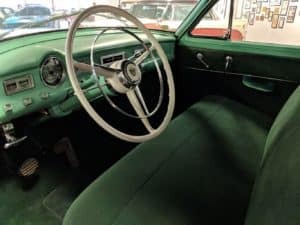 The car has been repainted in the original colors, however, the interior is completely original including the original engine, wood wheels, and even back-up hand crank to start the car. No new vehicles were produced in the United States during WWII from 1942 to 1945. Demand was high after the war and waiting lists became common as everybody wanted to purchase a new car. 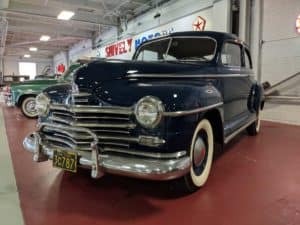 The 1946 to 1948 Plymouths are virtually identical due to the fact that manufactures did not need to make any changes to the models because of the strong demand. That would soon change. This 1948 Plymouth was such an example. Nevin Murray, a WWII veteran, was on a waiting list for over a year to purchase a new car. He took delivery of this 1948 Plymouth in September of 1948 from Barkdoll Motor Company in Chambersburg. Two months later he took this car on his honeymoon to Niagara Falls. Later he brought all seven of his children home from the Waynesboro Hospital in this car. He continued to drive this car daily for many years and it has over 200,000 original miles. After he passed away, the car remained garage kept as always until purchased by Shively Motors in 2014. The car was repainted in the original color and the seats recovered by Mr. Murray in 1991. He had the car painted because he literally waxed the paint off the car from cleaning it after every drive. It has been garage kept since new. 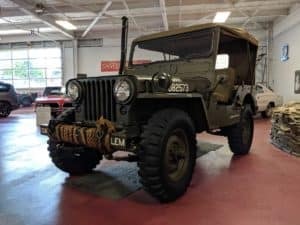 This particular 1952 Willys M38 was built for military use during the Korean War. This Jeep is also equipped with a snorkel and modified exhaust to enable it to drive through water. 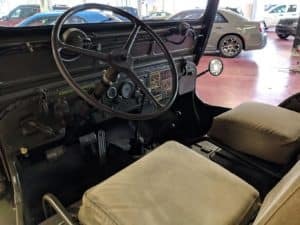 Currently, this Jeep is on loan to Shively Motors and is a classic example of the Jeep that had served the United States Military for decades. The name “Jeep” was in use even before the war and no consensus has ever been reached as to how the name originated. 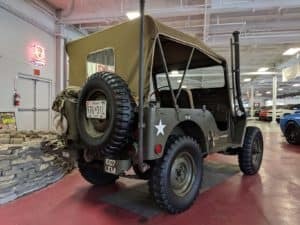 The M38 was the “Jeep” made by Willys from 1949 to 1952 and was the military version of the then current CJ-3A built for civilian use. 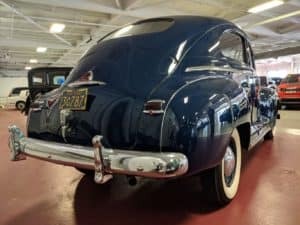 American cars are now beginning to change from the styles of the 1940’s. The 1953 Dodge saw it’s first “Hemi” engine that year and was called the “Red Ram” V8. This was the grandfather of the muscle car. Shively Motors sponsored a local driver, Charles Greene, and raced a 1953 Dodge V8 up and down the East coast. The 1954 Dodge was very similar to the 1953 model. 1955 would bring radical changes. 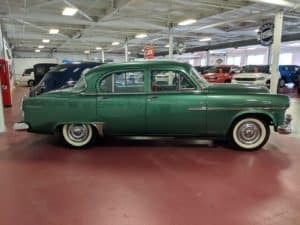 This 1954 Dodge Meadowbrook was purchased new at Shively Motors July 22, 1954 by Bernice Steiger. Henry Carbaugh purchased the car in 1981 from the Steiger family for $550. In 2004 he had the car completely restored as original. The car has just over 51,000 documented miles. The Meadowbrook was the base model for Dodge that year. This car has the proven inline 6-cylinder engine instead of the optional “Red Ram” V8. Shively Motors purchased the car from the Carbaughs in 2015. 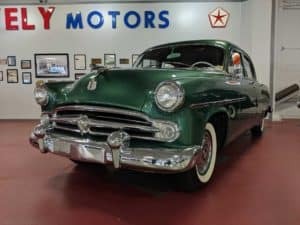 The 1955 model year brought major changes to the entire Chrysler product line. Virgil Exner was the head designer and created the “Forward Look.” 1956 brought more enhancements including the first push button automatic transmission and 12-volt electrical systems. Tail fins, more chrome, and tri-tone paint jobs created a much different appearance than just one or two years prior. Style and features became the hallmarks for the remainder of the 1950’s. 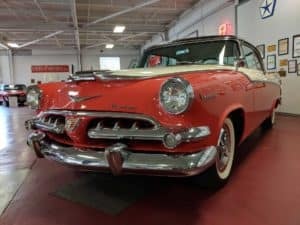 This 1956 Dodge Royal Lancer has no direct connection with Shively Motors, however, we have several pictures and artifacts that relate to the 1956 Dodge. One picture we have is of Shively Motors taken in 1956 with a full lot of new cars taken in color. We told a friend in Hershey, PA that if he ever came across a nice 1956 Dodge we would be interested. About 6 months later we received a call that he indeed found one. This is the car and the condition that it was found. 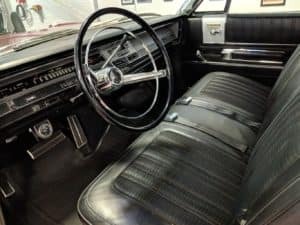 This car was properly restored as original with the original interior and options such as Power Steering, Power Brakes, and original Town and Country AM radio that still works. Shively Motors purchased the car in 2015. The 1966 Dodge Charger was a new model that year. Automakers were looking for something different in car design. The new “fastback” look was starting to enter the market. 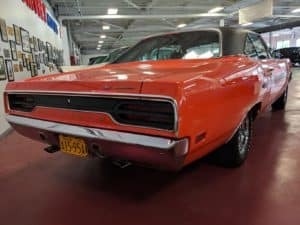 The Charger was based on the Dodge Coronet but with a new fastback design, fold away headlights, and four bucket seats that folded flat in the back to create large cargo space if needed. 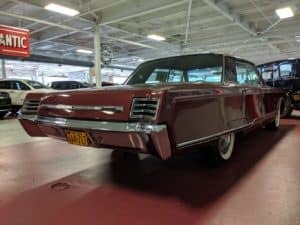 This body style, however, only lasted until 1967 when the more traditional 1968 B-body cars debuted. 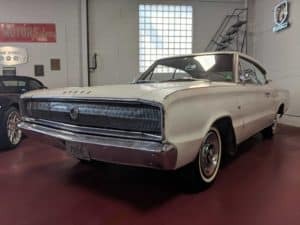 The 1966 Dodge Charger was introduced on January 1, 1966 during the Rose Bowl as the “Leader of the Dodge Rebellion.” This particular Charger was purchased at Shively Motors on January 22, 1966 by James Eger. He and his wife traded their two used cars on this all new Charger. They drove the car for ten years putting over 89,000 documented miles on the car. When the time came to purchase another car, they decided to keep the Charger in the garage. The car then sat for the next 40 years. The inspection sticker is still on the car that expired in 1977. Fortunately, the car spent most of the years in a garage and was still in decent shape. 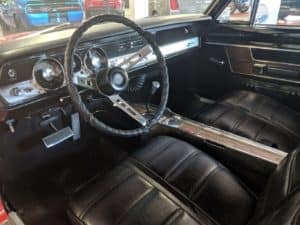 Their son told us that he had his parent’s 1966 Charger during a conversation when he was purchasing a much newer Dodge Charger at the dealership. After hearing about the car, we inquired about purchasing it. We then rebuilt the 318 V8, replaced the brakes, tires, fuel tank, and serviced the car. After 40 years, the Charger is back on the road. Everything is still original including paint, interior, even the hubcaps. A true “barn find”. The Chrysler Newport was the mainstream model for Chrysler and came in various body styles from convertible to station wagon. 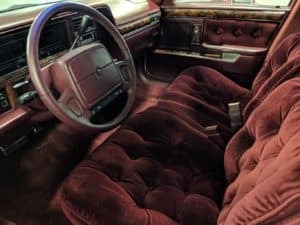 The 1967 model year was in the fourth generation of the Newport and the first year offering a more luxurious Newport Custom series. 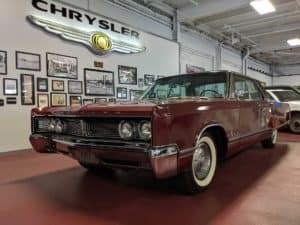 This 1967 Chrysler Newport Custom was purchased new at Coldbrook Motors December 13, 1966 by Raymond Armstrong. This car remained with the Armstrongs until 2014 when it was sold at an estate sale. The car then ended up at the Carlisle, PA show and was then sold to Mervin Buckwalter in Lancaster, PA. When he discovered the connection with Shively Motors, he mailed us a letter with pictures asking if we were interested in the car. We drove to Lancaster and purchased the car in 2015. 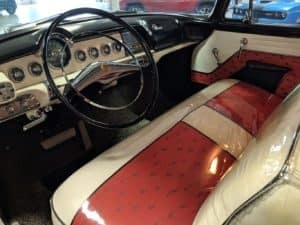 This car is all original including the original window sticker, manuals, and even receipt from the dealership when purchased new. The Plymouth Barracuda was introduced in 1964 as Chrysler’s answer to the new pony car segment. Ford was about to unveil the Mustang and Chrysler needed a new model to compete. The Barracuda was based on the Valiant and shared many of its parts but with a new fastback body style. The “pony car” segment was born. These were modestly equipped compact sedans and convertibles with standard 6-cylinder engines but could be customized with V8 power and extra options. 1967 bought the introduction of a convertible model. Most were built as fastbacks. 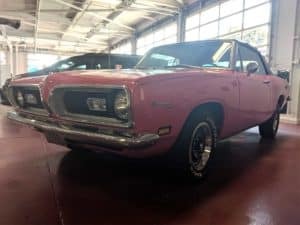 This 1969 Plymouth Barracuda convertible was actually taken in trade on a new vehicle purchase at Shively Motors in 2016. An older couple owned this car and had restored and enjoyed driving the car for over 30 years. They reached a point in life that they could no longer care for the car and had different transportation needs. Shively Motors is pleased to keep this Barracuda on the road. The 1968-70 Dodge Charger is one of the most iconic cars of the muscle car era. The new design was an instant hit. 35,000 cars where planned for production, however, over 96,000 Chargers were built that first year. This B-body model was made popular in many films and TV shows including the famous chase scene in the 1968 movie “Bullitt” and the popular 1980’s TV series “The Dukes of Hazzard”. The 1970 model year brought minor changes including a large wraparound chrome bumper and the grill was no longer divided in the middle. Electric headlight doors replaced the vacuum operated ones. New “High Impact” colors were offered giving the Charger a bold look. Engine choices ranged from the basic slant-six to the legendary 426 Hemi V8. Model choices that year included the base Charger, 500, and R/T. By 1970, however, production dropped to less than half of the 1968 level. This was due to both the introduction of the new E-body Dodge Challenger and rapidly increasing insurance rates. In the 1970 NASCAR season, the 1970 Charger had 10 wins, more than any other car. Buddy Baker, driving a Daytona, was the first and only legal car to run over 200 mph in 1970, a record that stood for 13 years. This 1970 Dodge Charger 500 is a very original example of the classic B-body design. This car has only one repaint in the original High Impact “Sublime” green. This Charger had only 2 previous owners since acquired by Shively Motors in 2018. 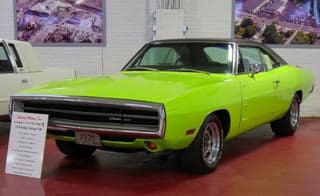 The Charger was originally sold by Music City Dodge in Nashville, TN. Included with the car is the original window sticker, build sheet, bill of sale and other records. 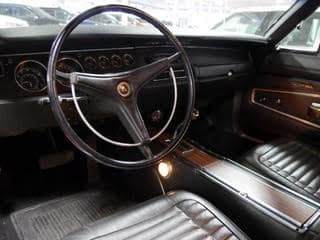 The interior and vinyl top are still original as well as the numbers matching 383 4bbl V8 engine. The 1970 Plymouth GTX was the positioned as the upscale model of the popular Road Runner. The GTX included more options and added luxury as well as performance to the car. 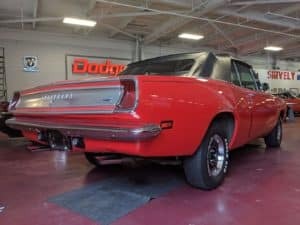 The 1968-70 B-body Dodge and Plymouth models are some of the most desirable cars from the muscle car era. 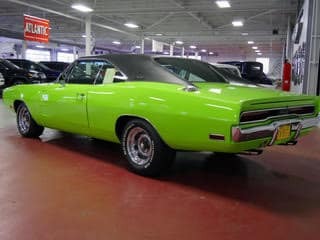 1969 and 1970 also brought the limited edition high performance models Dodge Charger Daytona and Plymouth Superbird. With an oversized wing on the rear and large aerodynamic nose, they did not sell well on the showroom floor. They did, however, produce important wins in NASCAR for Chrysler. Today these cars can demand very high values. 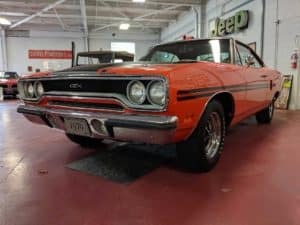 This particular GTX was completely restored by a former mechanic of Shively Motors. He spent over seven years working on the car to bring it back to original. Shively Motors purchased the car from him in 2015 when he decided to move out of the area. 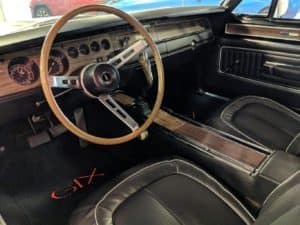 This car has all the desirable options including the Hurst “Pistol Grip” 4 speed transmission, Air Grabber hood scoop, bucket seats with full console, and even original AM/8 Track radio. 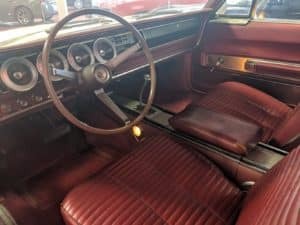 Details include new Goodyear Polyglas GT tires and original 1970 PA Dealer tag just as it would be ready for a test drive at the dealership in 1970. The Chrysler New Yorker had been a model used by Chrysler from 1940 to 1996 serving as the brand’s flagship for decades. The Fifth Avenue was a trim level or model name used from 1979 to 1993. 1990 was the introduction of the final Fifth Avenue models. This Fifth Avenue was built on a longer wheelbase than the standard New Yorker making it a full-size car once again. 1990 also introduced the return of hidden headlamps. 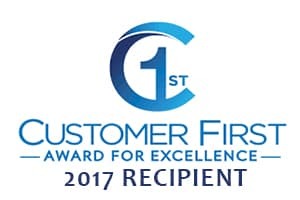 The Fifth Avenue models were covered by Chrysler’s market-leading “Crystal Key Owner Care Program” that included a 5-year/50,000-mile limited warranty and 7-year/70,000-mile powertrain warranty. 1993 would be the end of the Fifth Avenue as the all new “Cab Forward” LH cars would take their place. 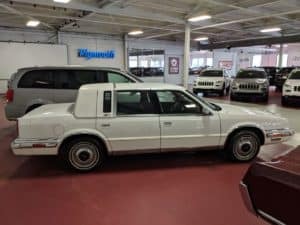 This 1990 Chrysler New Yorker Fifth Avenue was taken in trade on a used vehicle at Shively Motors in 2015. The car has less than 65,000 original miles and was originally sold by Shively Motors in 1990. 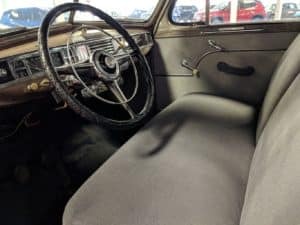 The condition of the car is all original as traded. Shively Motors celebrated our 50th anniversary in 1989. That year one of our customers purchased their 53rd car from Shively Motors. Displayed in our showroom is the newspaper article with pictures. 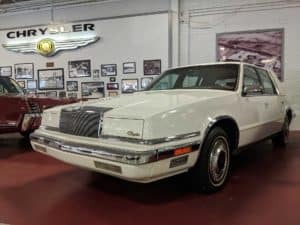 That car was a white 1990 Chrysler New Yorker Fifth Avenue identical to this car. The Dodge Viper debuted in 1991 as the pace car for the Indianapolis 500. The car went on sale in January of 1992 as the RT/10 Roadster. Lamborghini, then owned by Chrysler, helped develop the aluminum casting for the new V10 engine. The original Viper was a raw performance car with little creature comforts. It had no exterior door handles, no air conditioning, and no real side windows. The roof was canvas and the side windows were vinyl and zipped into place. The Viper continued for 5 generations of changes with a brief hiatus from 2010 to 2013. Due to increasing safety regulations and low sales numbers, FCA finally made the decision to discontinue the Viper in 2017. The 2004 Dodge Viper is the third generation of Viper. This generation has more comforts than the original such as power windows, AC, and real functioning convertible top. 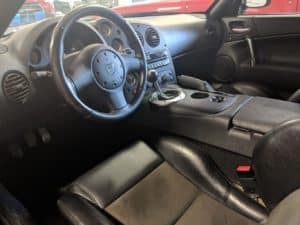 These Vipers, however, have no electronic systems to help correct the driver such as traction control, and is pure horsepower to the rear wheels. 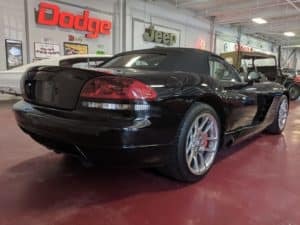 This 2004 Dodge Viper was originally sold new at Naugle Motors in Shippensburg, PA. Naugle Motors was the dealership that Shively Motors purchased in 2008 and is now Shively Motors of Shippensburg. This Viper was the personal car of Bill Naugle, one of the previous owners. 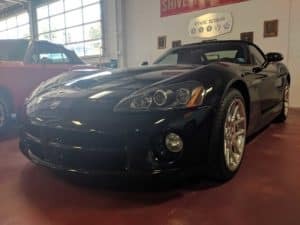 In 2011 Bill Naugle decided to sell the Viper and was then purchased by Shively Motors.